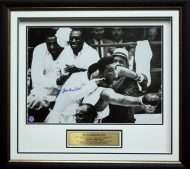 ‘The Thrilla in Manila’ was the third and final boxing match between Muhammad Ali and Joe Frazier. 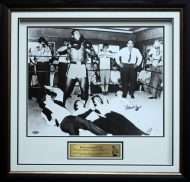 It was contested for the Heavyweight Championship of the World at the Araneta Coliseum in Quezon City, Metro Manila, Philippines on Wednesday, October 1, 1975. The contest’s name is derived from the frequent rhyming boast made by Ali that the fight would be a “Killa and a Thrilla and a Chilla, when I get that gorilla in Manila”.